Pro users will notice the Survey Length Estimator at the bottom of the side-bar on the Question List page. 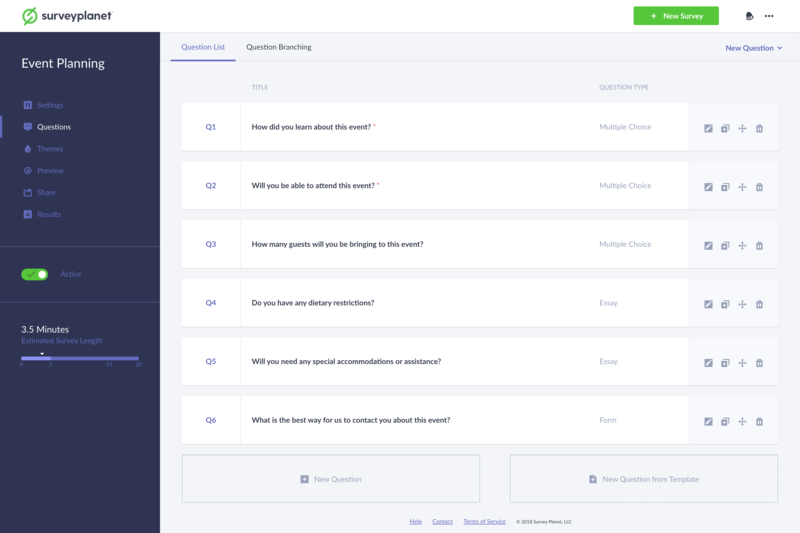 As you create and delete survey questions you will see the estimated amount of time your participants will need to take the survey increase or decrease respectively. For the best completion rate, we recommend that you keep your survey length under 6 minutes. If your survey is over 20 minutes you should consider removing and reorganizing some of your questions. Create as few choices as possible for Multiple Choice, Rating, Scoring, Form and Image questions. Multiple Choice and Image questions with Select Multiple option selected take longer to complete. Multiple Choice questions with Write-In Choice option selected will add time to your survey. Essay questions take the longest to complete of any questions type. Essay questions with Min Characters also take longer to complete. Form questions with lots of choices will have a large impact on your survey completion time. Scale, Rating and Date/Time questions take the least amount of time. Additional Comments increase the amount of time per question. Remember, less is more. If you create a survey that exhausts your participants’ patience, you can expect a higher bounce rate. Creating incentives, prize drawings, and other ways to reward those who take your survey will also help you in getting participants to take it. If you are needing specific criteria or panelists to take your survey, please check out our SurveyPlanet Audiences, a great resource for directing qualified respondents directly to your survey.